William Finley, Paul Williams, Jessica Harper, George Memmoli, Gerrit Graham, Rod Serling (introductory voice-over). 92 minutes. Some cult films improve their reputation and gain so many more fans over time that they effectively lose their cult status and become regarded as bona fide classics. Brian De Palma's SCARFACE (1983) is such an example. Unfortunately, De Palma's PHANTOM OF THE PARADISE is not such an example. It opened to poor box-office everywhere except three locations: Los Angeles, France and Winnipeg, Canada, where the film played for eighteen consecutive weeks! It's highly likely that those who have enjoyed De Palma's more high-profile releases like CARRIE (1976), THE UNTOUCHABLES (1987) and MISSION: IMPOSSIBLE (1994) don't even know this film exists. 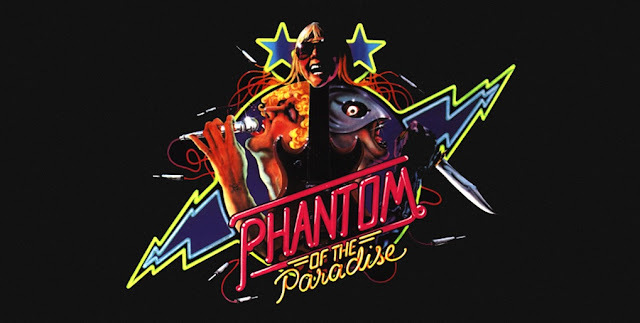 PHANTOM OF THE PARADISE was the penultimate film De Palma made before the great success of CARRIE (1976) took him into the mainstream. (The original title was PHANTOM, but King Features Syndicate, owners of the copyright to the comic book character of the same name, objected. De Palma capitulated because he didn't want a court case, even though he believed he would have won.) It's a musical (also written by De Palma) that cleverly, imaginatively and humorously incorporates elements from the movies THE PHANTOM OF THE OPERA (specifically the 1943 remake), and the silent classic THE CABINET OF DR. CALIGARI (1920), and also literary sources such as 'The Picture of Dorian Gray' (1890), 'Frankenstein' (1818) and the legend of 'Faust' (first printed appearance: 1587). De Palma cleverly uses these elements and references to create an attack on the modern music business, and by extension, the modern entertainment business. It's not hard to see a parallel between the full-blooded bitterness De Palma exhibits towards the Swan character (Paul Williams), modelled on Phil Spector (previous names for the character included Spectre and Dorian), and his own problems in Hollywood making the comedy GET TO KNOW YOUR RABBIT (1972): 'Tom Smothers became very difficult to direct and was ultimately instrumental in creating a totally unworkable situation. I said to the studio; 'Either you do it my way or no way'. I was taken off the picture.' To add to his problems, the movie was shelved for two years by Warner Brothers, who didn't know how to market it. The (actually quite convoluted) story involves music impresario Swan, who is planning to open a new concert hall he will call 'The Paradise'. Desperate for a perfect opening song, he is moved by a piece he hears writer/ singer Winslow Leach (William Finley) playing, and proceeds to steal it from him. When Leach confronts him at his mansion, he is beaten up and framed for heroin possession. Sentenced to prison, he is forced to enter a 'voluntary' experimental dental program where all his teeth are pulled, and replaced with metal ones. Leach manages to escape the prison, but suffers a terrible accident attempting to destroy a press at Swan's record factory: his sleeve gets caught in the press, and he crushes and burns his face, also managing to destroy his vocal cords. Believed to have drowned in the East River, Leach decides to become 'The Phantom of The Paradise'. Clad in a long, black cape and a black leather costume, with a silver, owl-looking mask, he starts to terrorise Swan and his musicians (scenes with The Phantom skulking around rooftops are echoed in Tim Burton's opening scenes in BATMAN, 1989), but is quickly caught and confronted by Swan. Swan proposes a deal to allow him to make the music the way he wants, persuading Winslow to sign a confusing contract that is literally a Faustian deal. Swan then proceeds to have him write a musical, and then be locked up forever in his mansion. Winslow escapes, and wants revenge, but his mission is complicated by the pact he has made with Swan, the fact that the girl he loves, singer Phoenix (SUSPIRIA's Jessica Harper) has also made a Faustian pact with Swan, and Swan's mysterious past. Danny Peary, in his book 'Guide for the Film Fanatic', believes that the film is 'a devastating attack on the mean-spirited glitter-rock scene of the '70's, where young lynch-mob audiences demanded increasingly vulgar and cruel entertainment'. De Palma doesn't only focus his scorn on the machinations of the music business, but also on the audiences. Any entertainment business is a business. And audiences vote with their feet. Swan certainly does turn Winslow's beautiful music into commercial crap that is the antithesis of it's author's intentions, but the audience laps it up. Swan knows for certain that assassinating Phoenix on their wedding day will be good for business because he is able to read his audience: they have a love for grand gestures and a lust for death and violence. Swan is morally questionable for how he manipulates his audience, but it doesn't say very much about the general public that they can be so easily manipulated and buy into his crappy music and violent stage shows. De Palma is also unimpressed by how easily women allow themselves to be consciously exploited in order for a shot of fame. It's interesting that with this film, De Palma was laying himself down as a personal, individualistic filmmaker, who like Winslow, refuses to sell out and is highly reluctant to compromise: CARRIE was only two years away, and he was on the cusp of actually becoming a director-for-hire who would use success to finance more personal projects. PHANTOM was not a big-budget picture, costing around $1m -$1.5m (by comparison, the year's top grosser, THE TOWERING INFERNO, cost $14m) but De Palma and his creative team make the money go a long way. The sets (designed by Jack Fisk, who also did BADLANDS, 1973), make-up (John Chambers) and costumes (Rosanna Norton) are beautiful and imaginative, owing as much to glam-rock as to the aforementioned literary and cinematic influences. De Palma's energetic style makes us forget that most of the action takes place in a mansion (particularly memorable is the chase scene where Winslow whizzes past camera and De Palma pans left, then pans right to catch him run into the room again - echoed in a similar scene in Martin Scorsese's THE KING OF COMEDY, 1982, which is an attack on celebrity culture - and the scary shots of of Winslow running through corridors that Ridley Scott might have remembered for similar shots in ALIEN, 1979. And of course, De Palma uses the split-screen process wonderfully.). Paul Williams's song score is vibrant, catchy and funny, and like the whole film itself, never succumbs to camp. The film never loses it's hard edge - De Palma never pans away from burned faces, blood or knife wounds, the attack on the music business is obviously coming from a real place (it ain't satire) and the characterisation of Swan - a music producer who uses the casting couch to get his way with women, gets his female singers hooked on drugs to toe the line, signs Faustian contracts with his employees and basically lies through his teeth to everyone he meets - feels uncomfortably real. It's the melding of fantasy, humour and reality that makes the film so interesting and not throwaway and conversely, it's probably what kept people from enjoying it in huge numbers at the time. The irony is that the audience De Palma was aiming for (or at least the studio) were the very audience who preferred glam-rock, and they of course rejected the movie. A year later (and about the time PHANTOM was wowing audiences in Winnipeg) THE ROCKY HORROR PICTURE SHOW (1975) would have a very similar reception to the film. 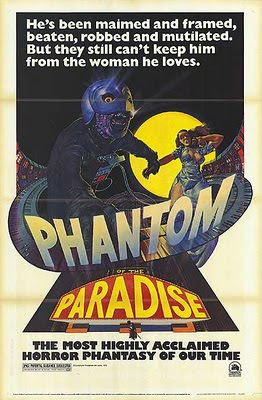 It opened well in L.A. (like PHANTOM) but did poorly elsewhere, until it began showing at midnight screenings seven months later in 1976 at the Waverly Theatre in New York. Currently it has grossed nearly $140m since it's release, and is one of the all-time cult movies. ROCKY HORROR indicates that there WAS a big audience for a musical that was outrageous and had classic SF and horror influences, but that the presentation was the key factor. PHANTOM has a very real centre, whereas ROCKY HORROR is a very entertaining slice of outrageous, camp fun that invites audience participation. It IS throwaway, but no worse for being so. Gerrit Graham is hilarious and the best thing in PHANTOM as the effeminate, whiney, foolish glam rocker 'Beef', whose stage character owes a lot to Frankenstein. But compare him to Tim Curry's equally hilarious turn in ROCKY HORROR. PHANTOM makes fun of glam-rock (or if you believe Peary, attacks it), whereas ROCKY HORROR is a full-blown celebration of it's excesses, invention and gender-bending. That said, the films have enough similarities that they have been paired together on double-bill screenings over the years. If anything would have made the picture even more memorable, it would have been better performances. Jessica Harper is charming, especially in the audition that is watched by Swan and Winslow/ The Phantom, where she obviously gets the delicate balance of the film (she's very good at kooky comedy and humorous facial expressions). But she's not allowed to build a character like she was in Dario Argento's SUSPIRIA (1977) or in Woody Allen's STARDUST MEMORIES (1980). (She actually played Susan Sarandon's role in the ROCKY HORROR sequel, SHOCK TREATMENT, 1981.) Harper beat Linda Ronstadt in getting the part. William Finley, a regular from De Palma's early work, does well in the parts of Winslow (the character's surname of Leach is a nod to Wilford Leach, De Palma's drama teacher at Sarah Lawrence College, a big influence upon De Palma) and The Phantom, being perfectly in tune with the film's slightly crazed energy, but he was right in believing himself not to be menacing enough in the latter role. (Paul Williams and Jon Voight were apparently considered at different points, but De Palma wrote the part for Finley.) Paul Williams is odd casting as Swan, and again isn't menacing enough. Not enough is made in the film of the disparity between his height (5' 2'') and Finley's height (6' 4''), and the fact a small man is manipulating a tall man. He manages to create an interesting character, but it's not entirely convincing, nor is his put on accent. De Palma should take the bulk of the blame for their performances since he was very insistent on them playing the particular parts. George Memmoli (so memorable in MEAN STREETS, 1973 as the 'mook') is very good as Swan's sleazy right-hand man. They all contribute to a light surface that mask the real contempt for entertainment business practices that made De Palma write the film (and Finchley accept his part). You might not fully catch the dark centre of the film on your first viewing. 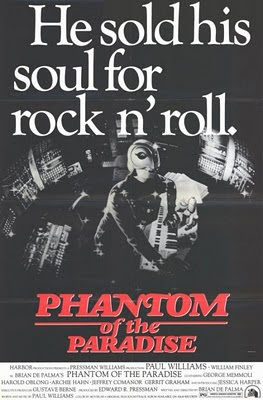 PHANTOM OF THE PARADISE deserves to be more widely seen, and to be placed in De Palma's ouevre as one of his very best. It's certainly the most charming and funny film he has ever produced, and shows what great creativity he can conjure up under low-budget conditions. It is also remarkable in the way it achieves a delicate balance between attacking the very real world of the entertainment world and business, and for being a successful musical with influences that could have been incongruous: glam-rock, and classic horror literature and cinema. NB. Sissy Spacek is credited as 'set dresser'. She assisted her boyfriend (and future husband) Jack Fisk, the film's production designer. The couple met whilst making BADLANDS (1973), which Fisk designed and Spacek acted in. Spacek later played CARRIE (1976) for De Palma. Swan's record label in the movie had to be changed from Swan Song to Death Records because Led Zeppelin's label had the same name. The original logo can be seen in certain scenes set in the Paradise, and the Death Records logo is superimposed over the Swan Song logo in the press conference introducing Beef. De Palma was inspired by an idea by his two friends (Mark Stone and John Weiser) about a 'Phantom of the Fillmore'. (There was a very similar photoplay to PHANTOM OF THE PARADISE included as a photoplay in National Lampoon's Magazine, November 1971 entitled 'Phantom of the Rock Opera'. De Palma insists he never read the story.) The location got changed to the fictional The Paradise after manager Bill Graham wouldn't cough up the rights. AVAILABILITY: The film is only available on bare-bones releases, except in France where a 2 disc Ultimate Edition is available on DVD and Blu-ray. 'Brian De Palma Interviews', edited by Laurence F.Knapp, University Press of Mississippi, 2003. 'Guide for the Film Fanatic' by Danny Peary, Simon and Schuster, 1987. Paul Rowlands is a Japan-based writer. After completing a BA Humanities course (majoring in English and Science) at the University of Chester, he moved to Japan in 1999. Paul writes for the James Bond magazine, Kiss Kiss Bang Bang, and has had an almost lifelong obsession with cinema, something the advent of DVD only increased.